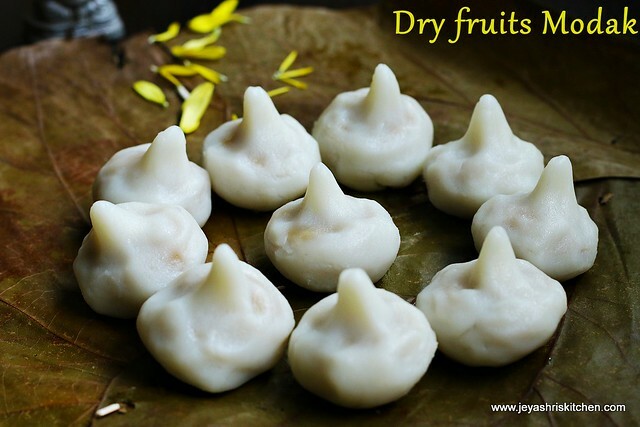 As Ganesha Chaturthi is round the corner, i thought i will quickly i will post the recipe of dry fruits modakam. 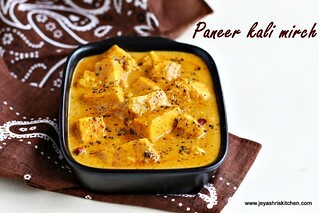 Actually i wanted to post Peanut modakam ,but added some dry fruits into this. 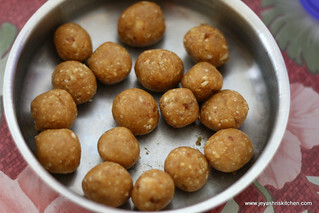 I have posted Dry fruits ladoo for last year diwali . 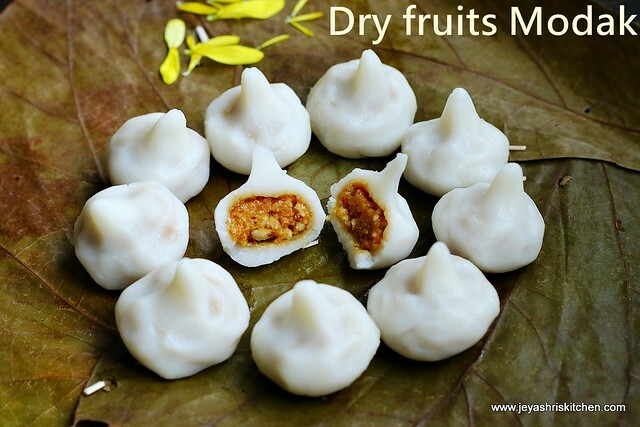 You can make the same and make it in modak shapes and offer as neivedhyam. 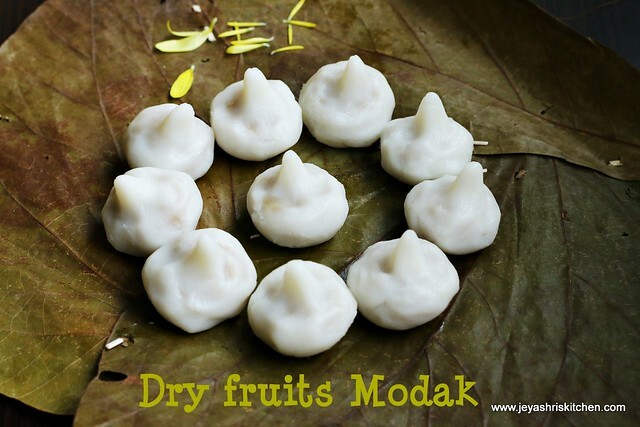 I have made this as a traditional south indian modak with outer covering. 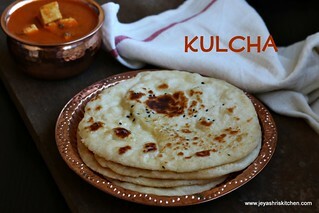 Check out my other Ganesh Chaturthi recipes too. Boil the water nicely. Keep the flour in a broad vessel. 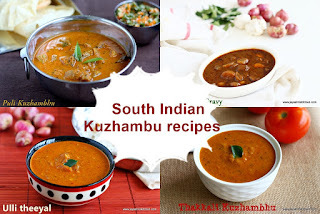 I used idiappam flour. Pour the water slowly to the flour and mix well. 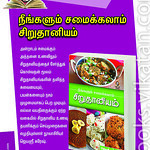 The quantity of water depends on the texture of the flour. When it is warm and easy to handle,grease your hands with sesame oil and and knead this well into a smooth dough without any cracks. Keep it covered. 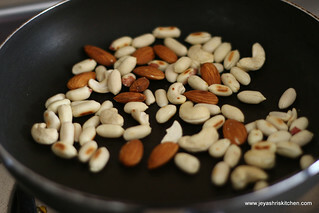 For preparing the poornam, dry roast the peanuts,cashew nuts and badam for 5 to 7 minutes without getting this burnt. 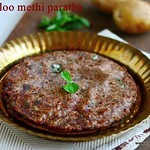 Grind this along with powdered jaggery and coconut. Do not grind this too much. Little coarse is fine. 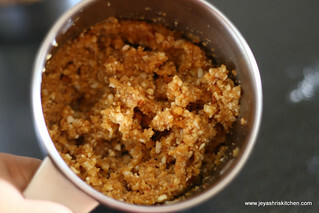 The moisture of the jaggery and the nuts will make it watery if you grind for a long time. Keep it aside and make into small balls. Make the little bigger lemon sized balls out of the dough. 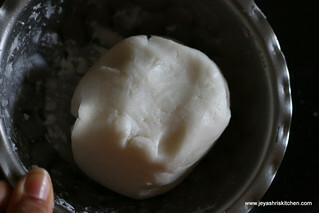 Grease your hands with sesame oil and with your fingers make a small cup out of it and place the poornam in that. 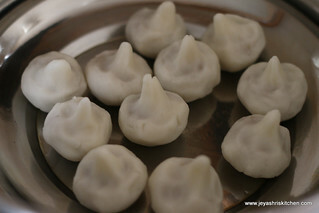 Make modak by covering the dough. Repeat this for the rest of the dough and poornam. 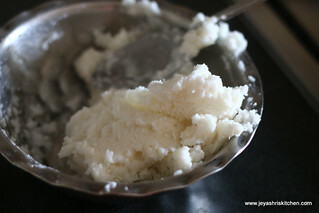 Grease a plate or idli plate and place the modakam and steam this for 10 minutes till the outer cover becomes shiny. 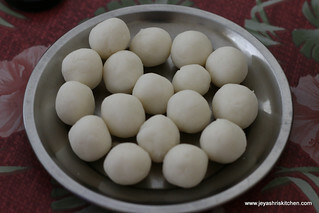 Modakams are ready for neivedhyam. Always keep the dough covered to avoid drying. 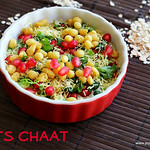 You can omit the peanuts and add little more cashew and badam and also pistachios and walnuts. 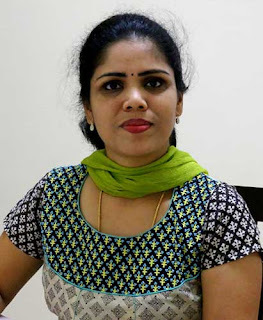 Instead of jaggery dates can also be added. 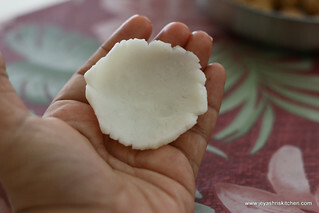 I used the fresh coconut. 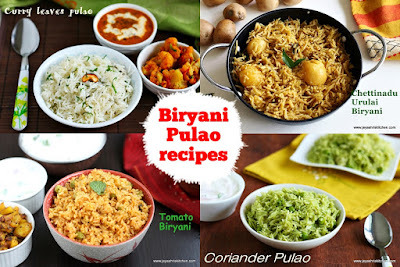 You can add dry coconut too(koprai). 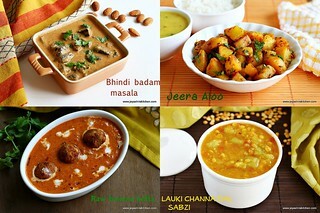 The Modhakams looks amazing and I love the texture.. 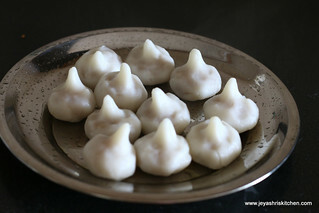 Happy Vinayaka Chathurthi to you and your family.